We are proud to announce the launch of our very own online Jump School! We've taken the best bits of our Jump Fundamentals program, and placed them online so that everyone can now sign up, at any time, and work their way through the course at their own pace. Jump Fundamentals is exactly what it sounds like: a fundamental, introductory overview course designed for any jumper—past, present, or future—with some, none, or all prior experience in taking a jump. Busy? Limited free time with work, school, kids, family? No problemo. We designed Jump Fundamentals as a self-guided, go at your own pace experience. You'll have all the core material to get started on your jump. Education. You'll be challenged from day one, with weekly assignments and activities designed for personal growth, as well as strategic planning and long-term goal setting. From reflection tasks and group discussion prompts to read/watch/listen assignments and homework worksheets, our education modules are thoughtfully designed and carefully crafted to push you forward in your jump and in your life. Inspiration. We'll immerse you with curated jump content from across our platform of stories from jumpers of every type, making jumps of all kinds. Guest lecture videos and Weekly Wisdom talks will provide both the inspiration, and the insights, to help you craft and guide your jump. 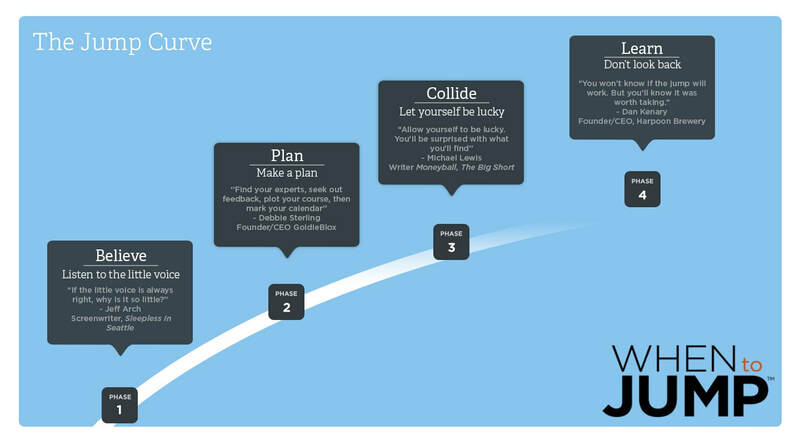 Jump Fundamentals is structured across four learning modules, with each module relating to one of the four phases of the Jump Curve framework: Listen to the Little Voice, Make a Plan, Let Yourself Be Lucky, and Don't Look Back. See below for a visual representation of the framework. Lastly, Jump Fundamentals is truly designed for anyone. ​Our students range from millennials to baby boomers, single parents to first-generation immigrants. You don't have to have started a jump—or even have a jump in mind—when you take this course. ​We'll meet you wherever you are, and push you further in your journey.